Crab stick is a processed seafood made from starch and finely minced white fish, shaped to look like the leg meat of Japanese snow crab. They don’t contain any crab meat and my mom used to add them into soups, steamboats etc, but I’m never very fond of them because they just taste odd to me. But I love crab stick snacks – peeled and deep-fried, they are so crunchy, delicious and addictive that I can finish the whole tub of them in less than a week! 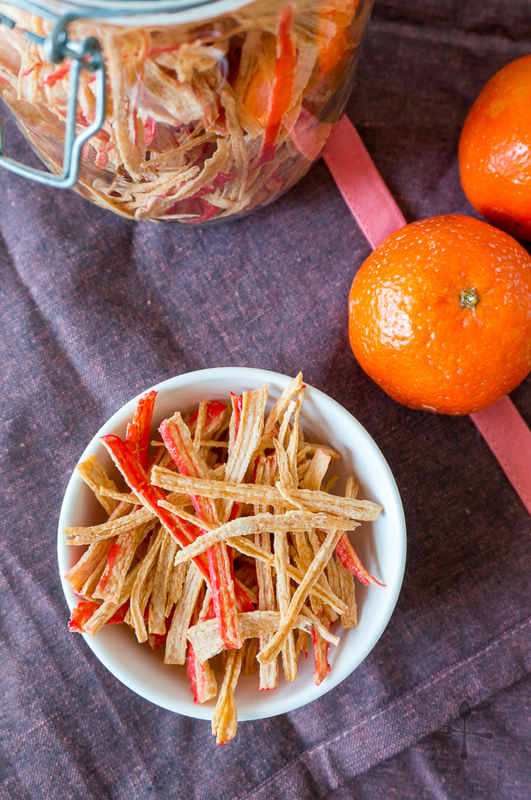 Every Chinese New Year, my mom will always make a huge tub of this addictive snack instead of buying them because it’s so much more economical. As I will be away from home for this year’s Chinese New Year, I decided to try making it myself. Instead of deep-frying, I chose to bake the crab sticks because I’m not very confident of deep-frying – too hot and the crab sticks will burn on the outside but still soggy on the inside; too cold and the crab sticks will taste oily. With an oven, the temperature is more constant and I can monitor them more easily. Making sure they don’t overlap with each other! The most tedious part of making this has got to be unrolling them. I spent almost 1.5 hours unrolling 3 packets of crab sticks! But this is perhaps due to the so-so quality of the crab sticks I’ve gotten. My friend told me that some brands are actually pretty easy to unroll, but sadly those brands can only be found in Singapore. Here, we only have one brand of crab sticks to choose from… (well, on a positive note, at least there’s crab sticks here, if not I won’t even be able to make this!) If I’m going to make them again (which is highly likely as half a tub is already gone after only one day…), I’m definitely going to ask X to help me out! 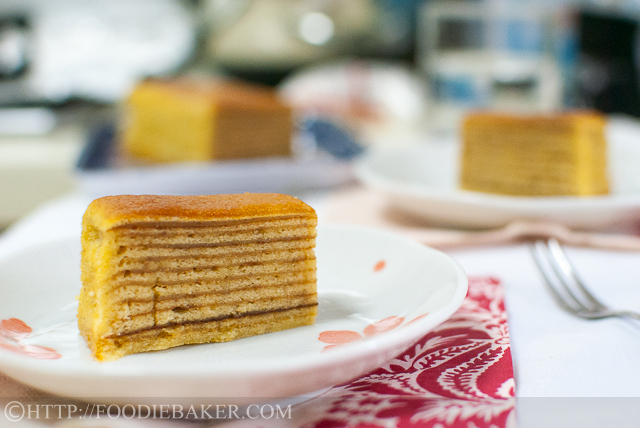 No step-by-step photos because it’s very straightforward for this recipe! 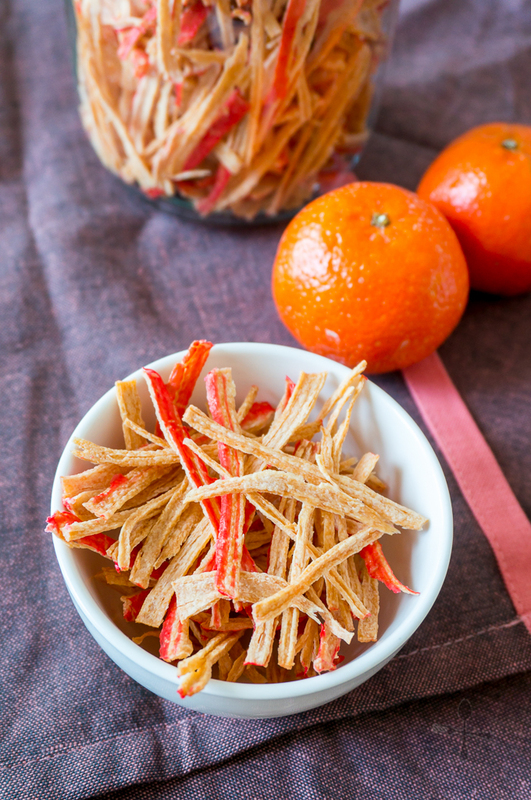 Here are other Chinese New Year Goodies on the blog if you are interested! 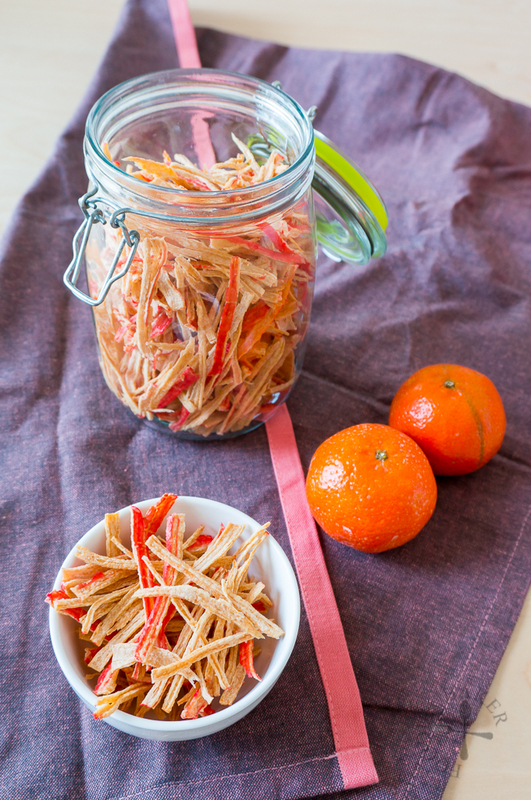 This addictive snack is incredibly easy to make - the only time-consuming step is the unrolling of the crab stick, which you can enlist your family to help. Do make more if possible as they will all be gone too soon! Preheat oven to fan-mode 140C / 285F (see note). Line several baking sheets with baking parchment. Spray the parchment very lightly with canola oil. Peel off the crab sticks' plastic wrapper and carefully unroll them into thin layers (as thin as possible). Place the crab sticks on the baking sheets in a single layer, without overlapping with one another. Spray the crab sticks with another very thin layer of oil. 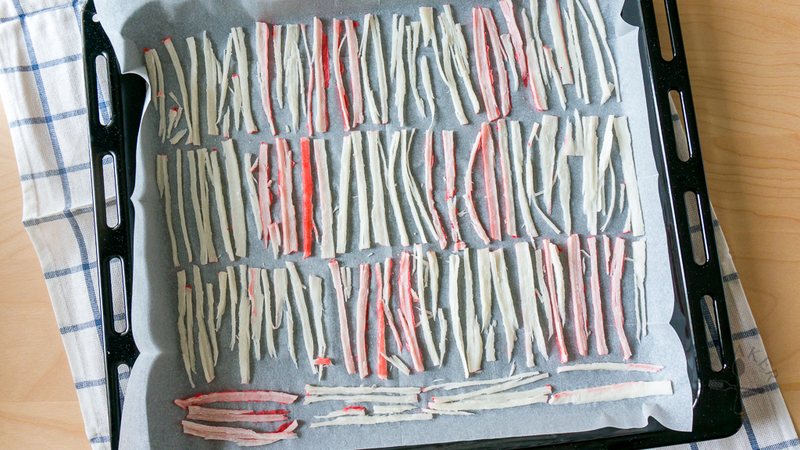 Bake the crab stick for 20 minutes. Rotate the baking sheets then bake for another 15 to 20 minutes, until all the crab sticks are lightly browned. There should not be any whitish parts on the crab stick as they will be chewy instead of crunchy. Place the baking sheets on wire racks and let cool completely then store in an air-tight container. - I used the back-fan function of the oven - heat is produced at the back of the oven without the top and bottom heating element. The fan helps to circulate the heat evenly in the oven, enabling me to cook several trays of crab stick at the same time. The top and bottom trays of crab stick will not burn as the top and bottom heating element are not switched on. If you only have a small oven or can only use the top and bottom heating element, bake the crab sticks one baking sheet at a time and adjust the temperature and baking time accordingly (see Step 3 to check for doneness). - I'm currently using a Norpro Stainless Steel Oil Mister, it's not very perfect, but does the job. You can use any cooking spray you can find in the market. - If you find the crab sticks become chewy the next day, it means that you have not baked the crab sticks long enough. Re-crisp them in the oven at 160C / 320F for 5 to 10 minutes. Such a classic CNY snack! Yum! I love the cream and squid sticks…thanks for the recipe…so easy! Here is something I’ve never had but they sound wonderful! Certainly a labor of love unrolling them but well worth the effort. They look so crispy! This is so awesome…what a great recipe! I love that your mom used to make these and I just never thought about being able to do this at home. Glad to see this. : ) Hope you have a great Chinese New Year coming up. Baked crabsticks sound so interesting and the other recipes look well worth a try too!